The Missile Defense Agency and Japan Maritime Self-Defense Force launch an SM-3 Block IB missile from the Japan destroyer, JS ATAGO (DDG-177) off the coast of Kauai, Hawaii, Sept. 12, 2018. The U.S. Department of State approved a previous sale of eight SM-3 Block IB missiles and 13 Standard Missile-3 (SM-3) Block IIA missiles for an estimated cost of $561 million in November 2018. 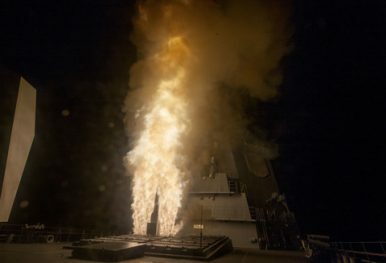 The missiles will be deployed aboard Japan’s Aegis-equipped destroyers and its two Aegis Ashore batteries, the land-based variant of the Aegis combat system for defense against ballistic and cruise missiles, which is slated to be deployed by 2025. The U.S. Department of State approved the sale of two Aegis Ashore batteries to Japan in January of this year. The two batteries will be stationed in Japan’s Akita and Yamaguchi prefectures and are capable of firing the SM-3 Block IIA/Block IB interceptors as well as the supersonic SM-6 missile interceptor. The supersonic SM-3 Block IB interceptor is an upgraded variant of the original SM-3 missile fitted with an enhanced two-color infrared seeker and features an upgraded steering and propulsion capability. The SM-3 Block IB, first flight tested in 2011, is designed to destroy incoming short- to intermediate-range ballistic missile targets in midcourse. The weapon system became first operational with the U.S. Navy in 2014. The SM-3 Block IB missile was last test fired by Japan in 2018. In September of that year, the JS Atago, the lead ship of the Japan Maritime Self Defense Force’s (JMSDF) Atago-class, shot down a mock ballistic missile target outside the earth’s atmosphere, fired from the Pacific Missile Range Facility, at Barking Sands, Kauai, Hawaii, with an upgraded SM-3 Block IB interceptor. The test was part of a joint U.S.-Japan program currently underway to upgrade the JMSDF’s two Atago-class guided missile destroyers with the Aegis Baseline 9/BMD 5.0 (J6) combat system specifically designed for sea-based ballistic missile defense (BMD).